Lifting beams offer a safe and easy forklift attachment for handling rebar and rebar cages. A popular forklift attachment with metal building erectors. Lefitng beams are used for moving long metal rebar as well as sheet metal roofing and siding. lifting beams come equipped with fork pockets that will accept up to 7” wide x 3” thick forks. 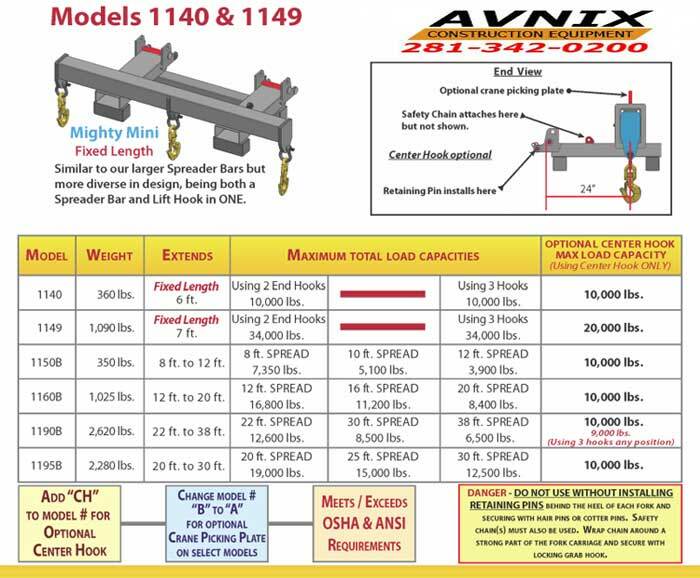 Avinix’s model ER1150 lifting beams are intended for use with rough terrain telehandler forklifts, either straight mast or extendable reach. Lifting beams come equipped with fork pockets that will accept up to 7″ wide x 2 ¾” thick forks. A center hole offers a hook point that also allows the lifting beam to be hanging from a hook. The model ER1150 meets/exceeds the requirements of ASME B30.20-2006 and is classified as Category B and Service Class 2 as defined in ASME BTH-1-2005. Make sure the forklift operator is well skilled to operate the specific telehandler forklift model to be used, has read and understands this and has reviewed the forklift operator’s manual for any additional requirements, limitations, restrictions, or additional safety measures used by the forklift manufacturer when using this type of attachment. The forklift operator must also be properly certified under OSHA requirements to operate the forklift to be used. 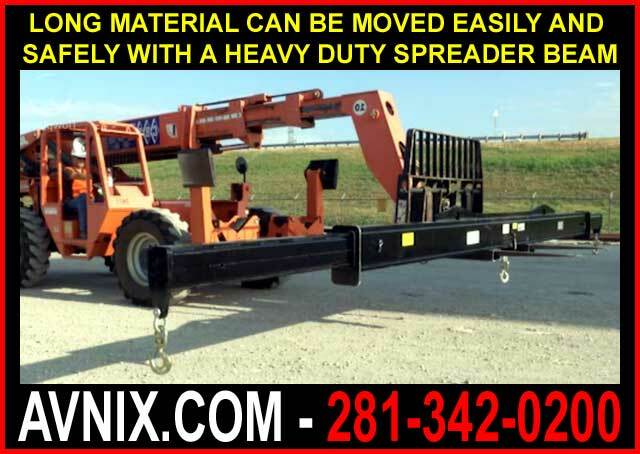 Inspect the lifting beam or spreader bar to make sure it is in excellent working condition. There must not be any broken welds, deformation of the steel tube or other parts, nor any cracks in the steel. The telescoping members should move in and out freely. Inspect swivel hooks and shackles to make certain they are complete, are in good condition, and that shackle anchor screw pins are screwed in tight. Make sure the spreader beam width adjustment pins are in place and have hair-pins installed to secure them. Check to make certain the fork retaining pins have hair pins to secure them in place as well. Check that all decals are in place and legible. The following decals are required: “Empty Weight”, “Read Before Using” and “Rated Lift Capacity. . Replacement decals are available from a AVNIX.COM. Make sure employees involved comprehend any hand signals that will be used and all involved workers understand what will be required of them. Make sure the travel path is clear of obstructions and that adequate clearance will be maintained from all power lines.